J. J. Latting and W. N. Howard, "The Crossman Family", The New York genealogical and biographical record Vol. 22, No. 2 (April 1891): p. 78. Vital records of Taunton, Massachusetts to the year 1850, Boston, Mass. 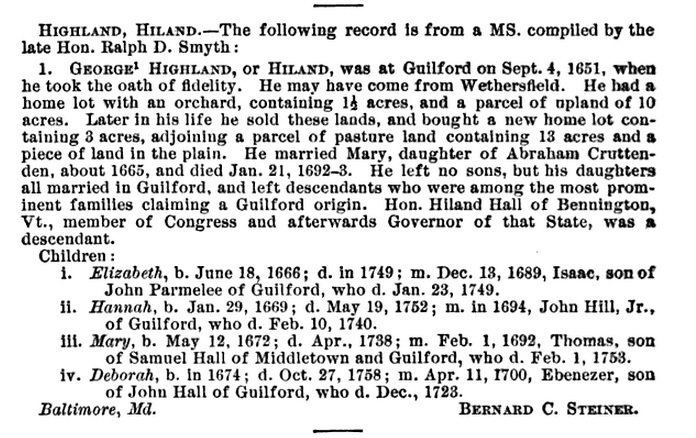 : The New England Historic Genealogical Society, (1929) , p. 112. Charles E. Benton, Caleb Benton and Sarah Bishop: Their Ancestors and Their Descendants, , at http://books.google.com/books?id=76hOAAAAMAAJ . Poughkeepsee, New York: Press of the A.V. Haight Company, (1906) , p. 42. The New England Historical and Genealogical Register, Volume 160, New England Historic Genealogical Society, (2006) , p. 214. Edith Bartlett Sumner, Ancestry and descendants of Amaziah Hall and Betsey Baldwin, Los Angeles, Calif.: American Offset Printers, (1954) , p. 105. 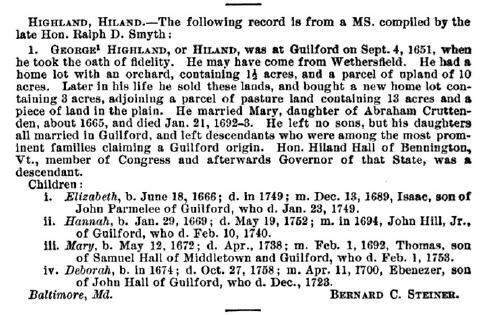 Unknown author, "Notes:: Highland, Hiland", The New England Historical and Genealogical Register Vol. 62 (1908): p. 384. H. F. Johnston, Your Ancestors: A National Magazine of Genealogy and Family History, Vols. 6-9, (1952) , p. 978.
living at 210 Rantoul Street, Beverly, Massachusetts. "Massachusetts Deaths, 1841-1915," database with images, FamilySearch (https://familysearch.org/ark:/61903/1:1:N4ZK-PS9 : 10 December 2014), Oscar Cummings, 08 Jun 1915; citing Beverly,,Massachusetts, 141, State Archives, Boston; FHL microfilm 2,406,042. "United States Census, 1850," database with images, FamilySearch (https://familysearch.org/ark:/61903/1:1:MWZ2-VZ6 : 9 November 2014), Ammi C. Cummings, Plaistow, Rockingham, New Hampshire, United States; citing family 30, NARA microfilm publication M432 (Washington, D.C.: National Archives and Records Administration, n.d.). 1880 United States. Bureau of the Census. 10th census, Missouri, 1880 federal census : soundex and population schedules, Washington: National Archives and Records Administration, ([19--?]) , FHL Film 1254693; National Archives Film T9-0693; Page 432C. 1900 United States. Census Office. 12th census, 1900 population census schedules, Washington, District of Columbia: Bureau of the Census Micro-Film Laboratory, ([197-]) , Census Place: Beverly Ward 3, Essex, Massachusetts; Roll: T623 640; Page: 7A; Enumeration District: 259. Abbie Currier was born perhaps about 1812. Anna Currier was born perhaps about 1800. Betsey Currier was born perhaps about 1802.